The Toyota Certified Pre-Owned Vehicles program is proof of our commitment to constant improvement and is setting the benchmark for peace of mind amongst those in the used car market. 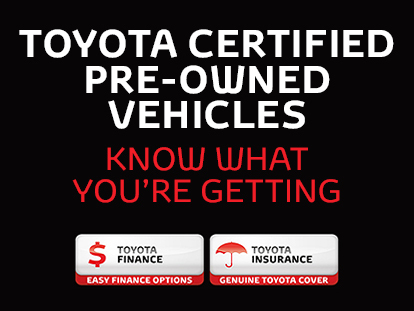 Not only does the Certified Pre-Owned Vehicles Program offer a range of benefits that no private seller could offer, it comes with the backing of Australia’s most trusted automotive brand, Toyota. Buying a used car can be time consuming, frustrating and worrying. There are a host of things to look out for and no matter how thorough you might be, a private seller may not be able to give you the sort of value or back-up Toyota can. To be thorough, you’ll need to check your potential vehicle’s ownership and service history along with ensuring you have a trained technician give it a fine-toothcomb checking for any potential flaws which will cost you in the future. At Chadstone Toyota we do this for you. These specialists know Toyota cars inside out so when they give a vehicle the thumbs-up and know that it is in excellent condition. When you drive away in a Toyota Certified Pre-Owned Vehicle you can be as sure of its past as you are of its future. All Toyota Certified Pre-Owned Vehicles come with a full service history. This helps to ensure the vehicle has been maintained to factory specification. They also have a rigorous CarHistory® check, searching Australia’s largest database of consumer and business credit records. All Toyota used vehicles are protected by any remaining factory warranty. Unlike buying a used car from a private seller, depending on your circumstances, Toyota Certified Pre-Owned Vehicles may also come with the Statutory Warranty provided by Chadstone Toyota. No matter how good your Toyota Certified Pre-Owned Vehicle is, things can still go wrong from time to time – you get a flat tyre, your battery runs flat or you lock your keys in the car. So if you buy a Toyota Certified Pre-Owned Vehicle we’ll give you one year’s worth of Toyota Roadside Assistance*. It is available 24/7 for 365 days. IMPORTANT NOTICE – please read: Toyota Australia has used its best endeavours to ensure this material is accurate at the time of publishing. However, all information must be confirmed with Chadstone Toyota at the time of ordering, as specifications and details will change over time. Colours displayed here are a guide only and may vary from actual colours. To the extent permitted by law, Toyota Australia and Chadstone Toyota will not be liable for any damage, loss or expense incurred as a result of reliance on the information and photos contained in this brochure (whether by way of negligence or otherwise). Offers may vary between participating Toyota dealers in separate regions and different States and Territories of Australia. Please ask Chadstone Toyota here if we are participating. [T1] Maximum payable for standard scheduled logbook servicing (normal operating conditions) until first of three years or 60,000kms, whichever occurs first (up to the first six services). Excludes Government & Rental vehicles. Contact Chadstone Toyota or go to Toyota Service Advantage for other exclusions, eligibility and full details. Applicability of Statutory Warranty may vary for used vehicles sold in different States and Territories in Australia. You must check with Chadstone Toyota to determine what Statutory Warranty is applicable (if any). Any Statutory Warranty does not limit and may not necessarily exceed your rights under the Competition and Consumer Act 2010. *Some commercial vehicles are excluded from the statutory warranty provisions in some jurisdictions. Please contact Chadstone Toyota for more information.